Mayor Emanuel joins Alderman Beale and community members at the grand opening of a new Walmart Supercenter in the Pullman neighborhood. 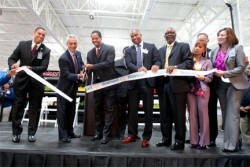 Early this week, Mayor Rahm Emanuel cut the ribbon at the new Walmart Supercenter located in the Pullman neighborhood. The Walmart Supercenter will create 400 new jobs and provide a wide variety of services to the neighborhood, including increased access to affordable groceries and a full-service pharmacy. The Walmart, located at 10900 South Doty Avenue, is expected to be a key anchor of commerce and economic growth in the area. The Pullman Walmart Supercenter will be open seven days a week from 7am to 11pm. The store will include a full line of affordable groceries including fresh produce and organic selections, convenience services including a full-service pharmacy and a MoneyCenter, and a complete selection of general merchandise.